Russian opposition leader Alexei Navalny, center, is detained by police officers in Moscow, Russia on Sunday. Earlier Sunday, video emerged of Russian authorities making their way into Navalny's campaign headquarters with what his spokesperson characterized as power tools, questioning staff and reportedly seized equipment. The spokesperson said the police claimed they were investigating a "bomb threat." Reports indicate around 200 protesters have been arrested across Russia. Navalny, no stranger to public dissent and arrests, called for Sunday's protests last month after he was barred from running in March's presidential elections against Putin, who will be seeking his fourth term and whose victory is all but a foregone conclusion. Navalny is also calling on Russians to boycott the election. The Kremlin denies accusations of corruption and says the election will be fair, Reuters reports. Putin has held office, as either president or prime minister, since 2000. Winning a new term in March would extend his presidency until at least 2024. 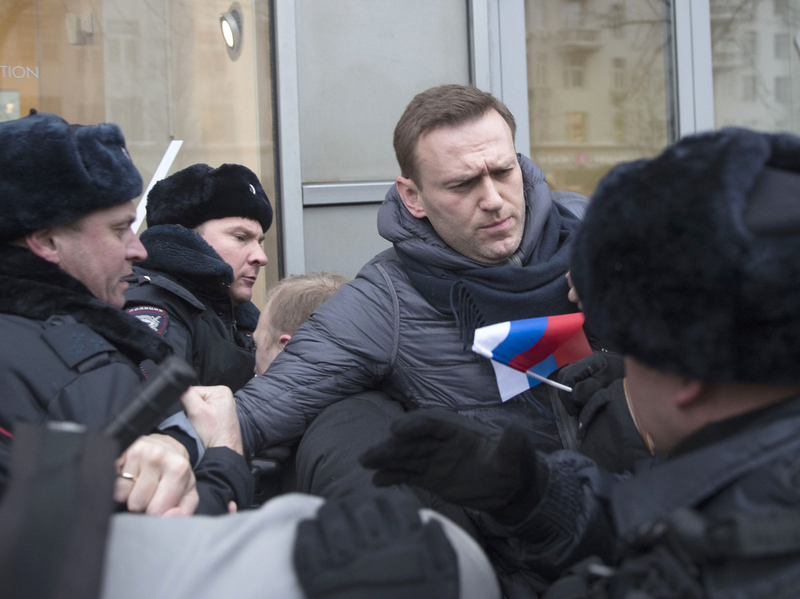 Footage of Navalny's dramatic arrest spread quickly on Twitter Sunday. Police — some in protective riot gear — work their way past a handful of Navalny supporters walking along a Moscow thoroughfare to apprehend the opposition leader. His followers clamor to wrest him back, but the officers lift Navalny off the ground and carry him feet-first into a large bus waiting nearby. Soon after a message on Navalny's Twitter account acknowledged his arrest, adding, "it does not matter," and that the rallies were about Russian's future, not him. Protesters gather during a rally at Pushkin square in Moscow on Sunday. 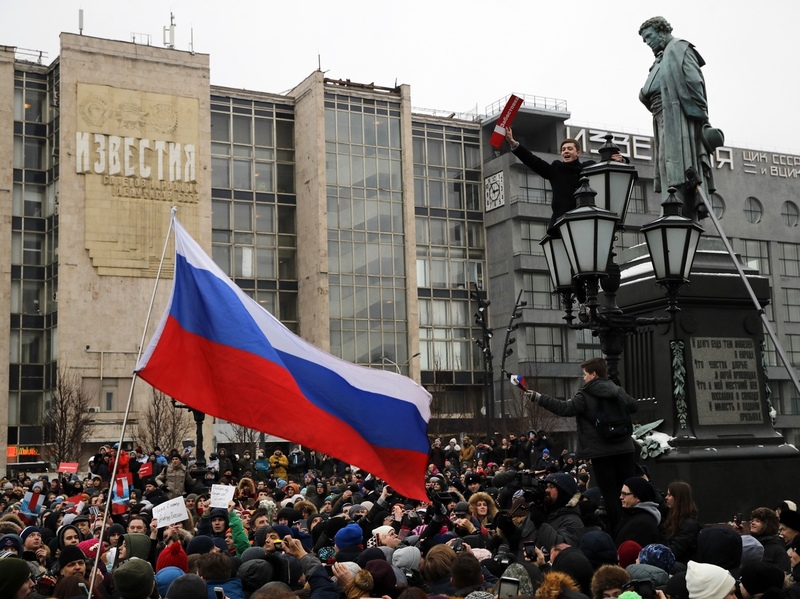 NPR's Moscow correspondent Lucian Kim reports hundreds of demonstrators made their way to the city's Pushkin Square Sunday before Navalny's arrival. Some chanted, "Putin is a thief," as police ordered them to return home. "To be honest, I don't support especially Navalny," Pavel Tikhonov, a 29-year-old who works for an international company, tells NPR's Kim. He showed up in Pushkin Square Sunday as part of a larger cause, he says. "I try to change our life — our life in Russia, I mean." NPR's Kim says state television devoted little coverage to Sunday's protests. Before Navalny's public detainment, Russian police also raided his campaign headquarters, reportedly responding to a "bomb threat." Spokespeople on one of Navalny's Youtube channels, which have been crucial in disseminating his anti-government message, narrated the authorities' attempts to enter their offices in real time. While Moscow's demonstrations may have drawn the most attention, they were not the only instances of public outcry in Russia Sunday. Across the country, as the Associated Press reports, rallies drew crowds sometimes of "a few dozen to several hundred people." Locations in the frigid Far East and Siberia hosted demonstrations too, including in the city of Yakutsk, where temperatures hit minus 49 F, according to the wire service. One watchdog group estimated more than 180 detentions on Sunday. Navalny, a lawyer and anti-corruption activist, is gaining name recognition, if not widespread support from Russia's public. One poll found more than 60 percent of Russian respondents trust Putin, with just two percent feeling the same about Navalny. NPR's Kim says many young Russians still can't identify Navalny when asked who he is. Despite Navalny's slim chances of unseating Putin, the Kremlin has stymied his political actions many times over the past year. His application to run in the March election was denied by the government, citing a past fraud conviction, which Navalny claims was a purely political charge. When he went to Youtube last month to call for Sunday's rallies, the video was temporarily blocked on account of featuring "improper hashtags," according to Navalny's telling of the incident. On the day of large protests in June of last year, Navalny was arrested at his home before he could join demonstrators, and sentenced to 30 days in jail on the charge of "staging an unsanctioned rally." He was also arrested in March of last year. During his annual televised, live call-in show in June, Putin chose not to say Navalny's name when asked about his political opponent. Putin simply "criticized unnamed opposition leaders who are only interested in exploiting the country's problems for their own political PR," NPR's Kim reported. Putin ignored another question about whether Navalny was producing a film about the Russian president.